I’d like to apologize first and foremost for not reviewing the first book in the series, Hood, since it’s been a while since I’ve read it, but I will mention a few things about it in reviewing Scarlet. The first thing I have to say about this book is a big THANK YOU! to Mr. Lawhead for providing an extremely useful pronunciation guide at the front of the book. In a story with so many Welsh/Celtic names, it’s nice to be able to pronounce them at least somewhat properly in my head rather than butchering them completely. I absolutely hate it when I can’t figure out how to say a name, and I find it makes it more difficult to remember the character. This series, starting with Hood, is a more historically realistic retelling of Robin Hood, or Rhi Bran Hud, as he is called in this story, which translates to King Raven the Enchanter. This telling is set in Wales in a forest known as the March, rather than Sherwood Forest. Merian, Friar Tuck, and Little John are represented, if not with those exact names. Now, onto the story. I was a little surprised at first how this story focuses on the trials and tribulations of one Will Scarlet and his association with Bran who we met in the first book. I was expecting this story to be a continuation of Bran’s story, but I really liked this different point of view. We are introduced to Will, in his prison cell, as he relates his tale to a priest while awaiting his execution. The more he relates the more you really want him to make it out of this alive, even if it seems his fate is sealed. I found I liked this story a bit more than the first for some reason. Perhaps it had a bit more action. I thought Hood was a little slower than I anticipated, but I think that comes primarily from comparing it to fantasy novels. This series is essentially historical fiction with only the slightest touch of the supernatural in the form of Angharad, a bard and adviser to Bran and his group of refugees. Since this is not a fantasy novel, there aren’t countless monsters and supernatural challenges to face, only mortal, flesh and blood, people, so that can slow things down just a bit. That being said, I really liked it. I like this history and the medieval politics. The characters are like able, except for the ones not meant to be, and those are as infuriating as possible. 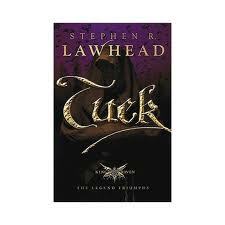 I look forward to the conclusion of the series, Tuck. Hopefully everything will turn out well for these poor people and Bran will get his land back. It’s unlikely, but I can hope.